By Kelsey Neely Meal May 18, 2018 No Comments on Should I Be Weighing My Food? It’s pretty obvious to most people looking to lose weight that portion sizes are something that you need to pay close attention to in order to meet your goals. Overeating is a sure-fire way to pack on a few extra pounds, even if you are making smart choices about what you are eating. Overeating by 500 calories per day without increasing your body’s expenditure adds up to a pound per week, whether you are eating 500 calories of vegetables or 500 calories of cupcakes. Even when we THINK we are doing a good job of estimating portion sizes, chances are we are taking in more calories than we intended. By measuring or weighing your food you can be more accurate with your intake, which helps you achieve your goals no matter what they are. A question that I think a lot of personal trainers, nutritionists, and fitness coaches get asked is which is better – weighing or measuring? Will you get better results by doing one over the other? Is one more accurate than the other? The answers to most of these questions are, of course, it depends. Nutrition and fitness is not a one size fits all thing and what is best for you will depend on what your goals and how much time and effort you are able spend working towards those goals. For starters, weighing your food is the most accurateway to track your intake. When you look at a nutrition label, the serving size is almost always listed in both weight (grams, pounds, ounces, etc) and measurement (teaspoons, tablespoons, cups, etc). The amount of food that fits in each measuring cup or tablespoon is going to vary based on material used to make them, design, manufacturer, and many other things. It’s also very easy to overfill a measuring cup when scooping up your food, leading to increased calorie intake. By using a food scale, you can “zero out” the scale before each use so that you are getting exactly how many grams or ounces you intend to, based on your calorie allotment. While there may be small variations from scale to scale, this is a much more consistent measurement with smaller variation then when using measuring cups and spoons. Does the fact that weighing your food is more accurate make it better? Maybe, but not necessarily. This all depends on your goals and the amount of time and effort you are willing and able to dedicate. In my experience, it is definitely much faster to scoop up half a cup of oats then it is to make sure you have measured out exactly 40 grams in your bowl. 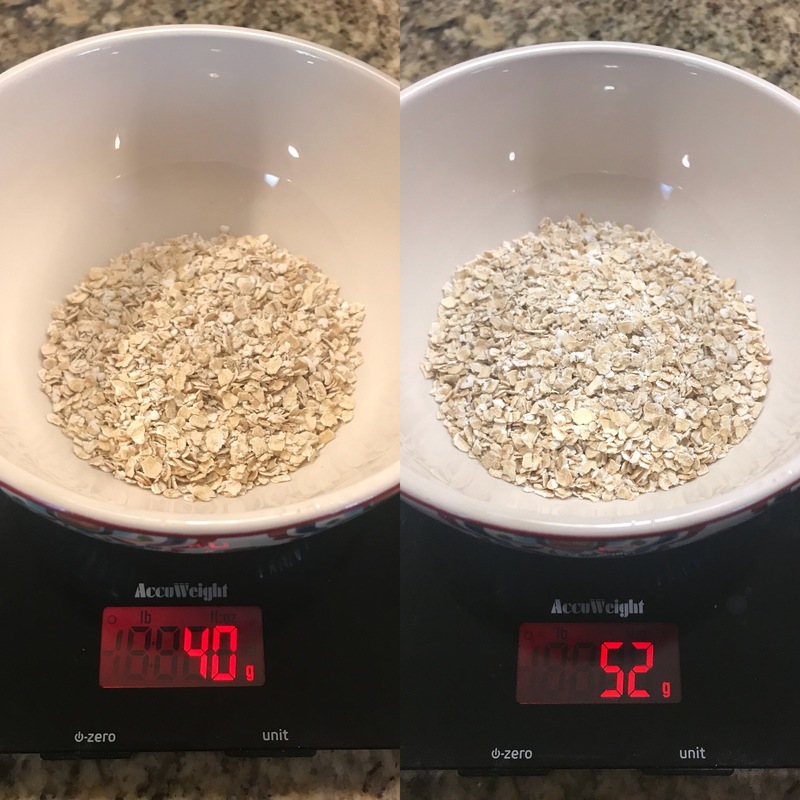 Check out the picture above… on the left is 40 grams of dry oats measured out using my food scale, and the right is a half-cup of dry oats measured out. According to the nutrition label, these should be the same, but do you see the difference? There are a lot more oats on the right than the left. By measuring our food, we are sacrificing accuracy for time, which is why this may be a better option for you, but it also may not be. Using measuring cups versus weighing is also an issue of convenience and cost. It is easier to use a measuring cup and they are also less expensive than a food scale, so this may also factor into your decision on how to measure your food. No matter which way you decide to measure your food, chances are you will still see results regardless as long as you are consistent and taking in a healthy and sustainable number of calories per day. Someone who is in preparation for a body building competition may feel their priority is accuratelytracking their intake, even if it does happen to be less convenient. On the flip side, a busy mom trying to lose weight postpartum probably is more concerned with how quickly and easilyshe can get her meals prepped. No matter how your look at it, keeping track of your portions is always better then NOT keeping track. It’s great if you have a food scale, but if you don’t a measuring cup works just as well. Even using the palm of your hand as a guideline is better than nothing at all and can save you when you are in a pinch and don’t have anything else with you. By understanding how each way of measuring can help you accurately estimate portion sizes, you can make sure you are able to achieve your goals no matter what situation you are in!